The Multiple Keltner Channels indicator is a generalized version of the Keltner Channels, replacing the SMA with any of 30 moving averages. Standard Keltner channels are built from a simple moving average (SMA) and two channels lines above and below. The two lines above and below are drawn at a distance from the center line, a distance which is a multiple of the simple moving average of the ranges of the past N bars. The Multiple Keltner Channels allows you to replace the SMA with any of 30 moving averages. The volatility measure used to calculate the distance of upper and lower line from the center line can be derived from an average range (AR) or average true range (ATR). You may select different lookback periods for the moving average that serves as the center line and the moving average which is applied to the range or true range. The Multiple Keltner Channels come with an additional smoothing option for center line and channel lines. The additional smoothing is obtained by further smoothing all plots with a 3-period simple moving average (SMA). Moving averages colored according to slope: You may also use this indicator to display any of the above listed moving averages and color them according to slope. The slope is not based on a geometrical concept, as this would not be compatible with the scalability of modern charting applications. The indicator adjusts slope to bar volatility such that the indicator may be used across all instruments and bar types with the same settings. The slope is shown as upsloping, downsloping or flat. The degree of flatness which is still considered as being flat may be adjusted via the neutral threshold parameter. When you set that parameter to zero, the slope will not show any flat sections, but the moving average will always be identified as upsloping or downsloping. Channel lines may be unselected, if you just wish to display the selected moving average. Volatility measures: The standard Keltner channel uses the range. This indicator also for substituting the range with the average true range. The average true range is used as default option to facilitate the application of the Multiple Keltner Channels to other indicators. Applying the Multiple Keltner Channels to indicators: When an indicator is used as input series, the range will always return the value 0. However, the average true range will return the absolute amount of the difference of two neighbouring data points of the selected input series. Therefore the indicator may only be applied to other indicators, as long as the offset formula is set to “True_Range”. Paint Bars: The Multiple Keltner Channel indicator comes with paint bars. The paint bars are colored according to the slope of the center line. The paint bars may be displayed without the indicator plots. The colors of the paint bar will then show the slope of the moving average selected as center line. 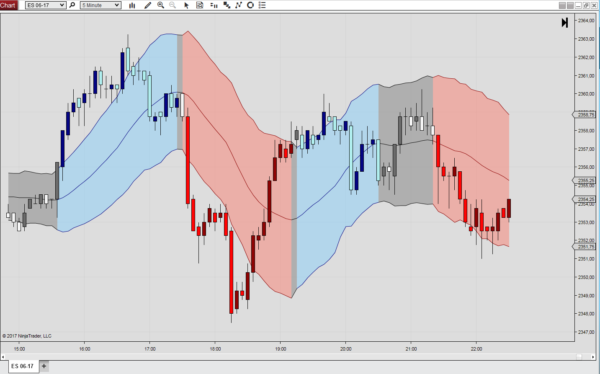 Sound Alerts: In case that the sound alerts are active, the indicator will alert you when the trend derived from the slope of the center line changes. Currently, there are no sound files included with the zip file, but it is easy to create them and copy them to the NinjaTrader sounds directory.